Above: Showy Milkweed flowering in Colorado in early June. 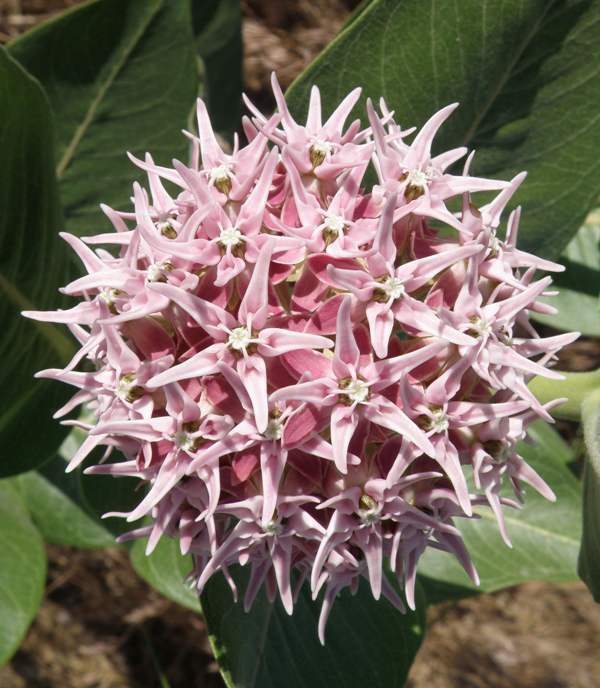 This gorgeous wildflower certainly lives up to its common name - Showy Milkweed. 'Showy' it most certainly is, and it is hard to miss if you catch sight of it growing along roadsides which is one of its favourite habitats. The plant grows to well over a metre in height and has large, handsome dark green leaves which have conspicuous veins. The lovely pink flowers open in a perfect globe, and close inspection reveals their unique structure. Unlike other members of the Milkweed family, Asclepias speciosa is not poisonous and has been used both as food and for its medicinal qualities. During the Second World War the soft downy seeds of Showy Milkweed were collected for use in military bouyancy aids and also as insulating material for flying-jackets. Showy Milkweed grows in both dry and moist habitats and you are equally likely to find it in roadside ditches as well as along riverbanks. It flowers from May through to August. The specimens on this page were photographed in Rocky Mountain National Park in early July.